Angled 90-degree Schuko CEE 7/7 (Euro) connector enables easy installation in tight spots. Plug into PCs, monitors, scanners, printers, and other devices that use the 3-pin shrouded power connector. 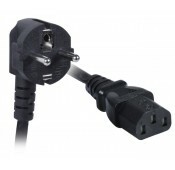 Supply end: Schuko CEE 7/7, down angled. When plugged in, the cable will extend straight down. Equipment end: IEC 320 C13, straight.